In our previous blog post, we gave a brief introduction of Navigation Architecture Component and explained some steps to implement it in your mobile app. As promised, we are back with more information like principles that you need to follow before using architecture components and major reasons to use it in your next Android project. So, without further ado, let’s get straight to the point! The Navigation Architecture Component is designed to execute these principles by default, guaranteeing that clients can apply the logic and principles in navigation as they navigate between apps. Navigating between the screens, which includes handling the back stack, implementing deep links, data passing, etc. can be complicated. The below-listed principles will help you set a baseline for intuitive user experience and avoid any kind of complications in the navigation process. After launching the app, the user should always land at a fixed destination. Fixed starting destination means the first screen that a user views when he opens an application from the launcher. This gives your client a glimpse of what he can expect when launching your application. Your starting destination should contain the foremost widgets like navigation drawer or bottom navigation bar. Let’s have a look at the following example of Sunflower app. When you launch the Sunflower app from your android launcher, the list screen will appear along with the app’s information. It will also be your last screen before leaving the app. You will automatically navigate back to the launcher when you press the ‘Back’ button from the list screen. Make sure you use the LIFO stack principle in your application during navigation. Your starting position will always be at the base of the stack. Navigating or exploring to the new destination means pushing the new destination at the topmost point of the stack while pressing the Up or Back button will automatically pop the given destination from the peak point of the stack. All activities that change navigation or the navigation stack should operate from the highest point of the stack. The Up button will always appear at the top of the screen in the app bar while the Back button appears at the bottom in the system navigation bar. Both the buttons behave identically within your app’s task. This would be valid in exceptional circumstances where the navigation stack is vacant. Unlike the Up button which should be hidden, the back button should exit the application in these circumstances. The Up button should only be utilized to navigate inside your Android app. If you are present at the app’s start destination, then this implies that your Back button should exit the app and the Up button should not be visible. Deep linking is a top-notch method to take clients directly to the content they need to interface with. If you want to remain consistent with the principle that your application should have a fixed starting point, deep linking should result in a similar navigation stack that a user would make during the normal navigation of your application. 1. Smaller API – It is one of the best reasons to use this library. This library contains a very small API along with proper documentation. Most of the libraries contain a class name that doesn’t make sense because of their high-level functionality. But this is not the case with the navigation architecture component. In this library, you would hardly find a class where the name doesn’t make sense. 2. Easier testing – Testing is crucial in app development. Testing fragment transactions, activity navigation and verifying a back stack on the JVM is impossible without using ‘Roboelectric’. But in the navigation library, you don’t need to do any of that for ViewModel testing. Navigation library provides a simple abstraction that gives you some great opportunities for testing. 3. Proper control over analytics – Navigation library offers a plethora of accurate methods for screen tracking. It provides you a powerful approach to do analytics if you are switching to a single activity. In order to write a replacement for the automatic tracking feature, you can also use the ‘FragmentManager’s LifecycleCallbacks’. 4. 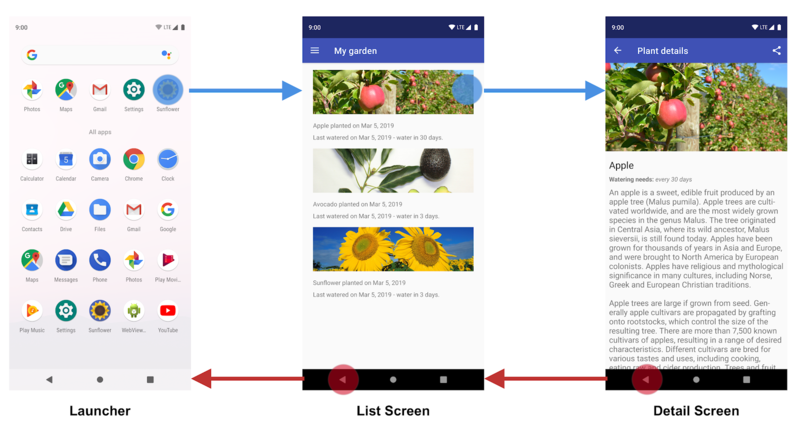 Android framework dependency – The design of the navigation library indicates that the ViewModel layer will only talk to the Navigator and pass it to a resource for an action, which means you don’t need any dependency on the Android Framework in that layer. 5. Support for Instant Apps – A software program that validates a user to test out a portion of a native Android app without installing it on a smartphone is known as an Android instant app. Navigation library offers some great methods that allow you to use Instant app feature in your application with the usage of resourceIds for navigation. While these were some reasons to use the Navigation Architecture Components in your library, there are many more such as conditional deep linking, Google Sign-in permissions, high-level abstractions, etc., which you can consider including in your Android mobile app. I hope you enjoyed reading this post. To conclude, the navigation library is a great addition to the architecture components. Its ability to decouple routing logic from the view layer and the inclusion of type-safe arguments & well-defined actions is something that makes it a robust API for Android app developers. If you are looking for a company that can provide you with the best Android, iOS app development services at affordable rates, then it is advisable to get in touch with Debut Infotech. For further assistance, drop us a line at info@debutinfotech.com or call us at 1-703-537-5009. Lead Mobile App Developer, covers wide range of technologies applied to the development of websites and business applications too. Enjoys doing creative things in Mobile and is passionate about developing unique Mobile Products.